Article about: Hallo, What's your opinion about this ring? Original or fake? On the last photo this ring with original RAD ring. What's your opinion about this ring? Original or fake? On the last photo this ring with original RAD ring. A known pattern. I believe this particular design is referred to as ‘Monkey Face’. 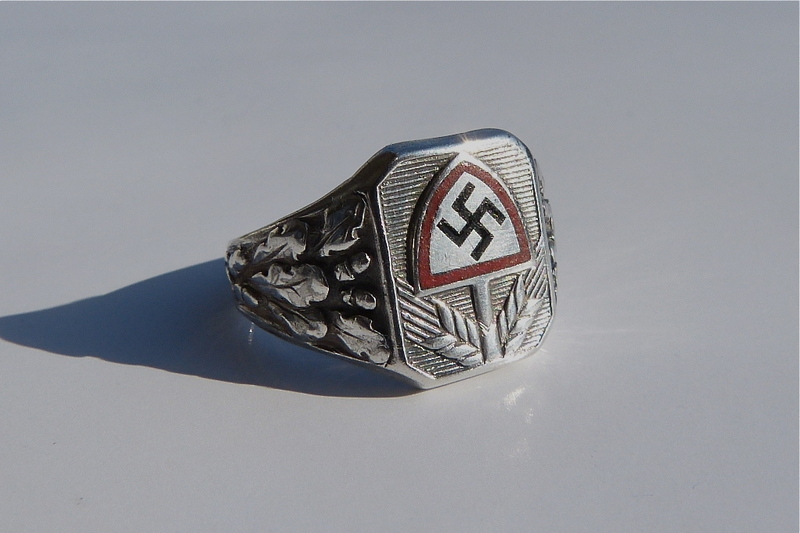 However, while I have seen several examples of this ring in silver and a silver-coloured alloy wash (probably nickel), I have never seen a specimen in brass or whatever this one is made of. Also, I don‘t like the seam on the shank. It doesn‘t look like it was ever soldered. Interested in what others think but I‘d be careful with this one. Looks cheap and nasty to me. Sorry! Last edited by SpitfireVb; 09-13-2018 at 04:57 PM. Here is an example of a plated Monkey Face ring. The plating does not look like silver and there is no maker- or hallmark. This is a small ring, probably worn on the pinky. It's ugly but I kinda like it. This RAD ring was originally silver-coloured too. Possibly but I think this is unlikely. Why on earth would anyone want to vandalise a nice ring, also thereby reducing its value, by doing such a silly thing? If the RAD was originally silver-plated, it is more likely that wear and tear removed any plating present. From the photo, it looks like an extremely worn ring. Alpacca Skull Ring - Opinions Please! Skull Ring with Red Eyes - Opinions Please!